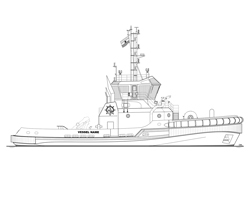 Turkey’s Tor Group, which specialises in the construction of both commercial and pleasure craft, is aiming to deliver three Robert Allan Limited (RAL)-designed, RAstar 3300-class tugs to the Ghana Ports and Harbour Authority (GPHA) by the end of the year. The Istanbul-based fabricator is now four months into building the steel tug trio, and working hard to stick to "an aggressive timeline of delivery", RAL comments. The urgency of this contract coincides with a notable, recent upsurge in cargo and container volumes in the West African state. For instance, between 2016 and 2017, the Ghanaian ports of Tema and Takoradi reported an upturn of 13% in cargo traffic (from 19.5 million tonnes to 22.1 million tonnes), accompanied by a 7% upswing in container traffic.This is prompting the need for more powerful tugboats with sizeable bollard pull (bp) capacity. Each tug will feature a length of 32.8m, a breadth of 12.9m and a depth of 5.37m. Typical duties will include ship-assist work, firefighting and pollution response. Each boat will accommodate up to eight crew members and store up to 180,500litres of fuel and 35,800litres of water. Given that temperatures can reach 50oC in this part of the world, each tug will incorporate a climate-controlled wheelhouse and an air-conditioned switchboard room, to ensure that both personnel and electrical equipment remain cool during operations. Each GPHA newbuild will be powered by a pair of Cummins QSK 95 engines, rated 2,685kW at 1,700rpm apiece, driving twin Rolls-Royce US2555 P30 azimuth thrusters. This arrangement will enable speeds of up to 13knots and a bp of at least 80tonnes, Cummins claims. A Rolls-Royce-manufactured hawser winch will be positioned on the fore of each tug’s deck, while a Mampaey quick-release towing hook on the aft will facilitate towing work. Cummins will also fit each tug with a QSK 28-M engine, rated 1,190kW at 1,800rpm, which will be tasked with feeding the fire pump. This arrangement should lead to Bureau Veritas granting each tug the FiFi 1 Waterspraying class notation. Meanwhile, a Cummins QSB 7DM generator, producing 136kWe at 1,500rpm, will power each vessel’s hotel requirements.